3. Malet / Orange Gate Junction. The family of the youth who was killed in Moday's protests told The Times of India that he had nothing to do with the protests. "We have nothing to do with either the celebrations or the protests. We are Maratha. Rahul was coming home to Sanaswadi on his motorcycle early when he came to know that there was trouble and a traffic jam at Koregaon Bhima," his youngest brother Tushar said. Tushar said it was his brother's bad luck. " It took one stone to kill my brother. There was heavy stone pelting at Koregaon Bhima. 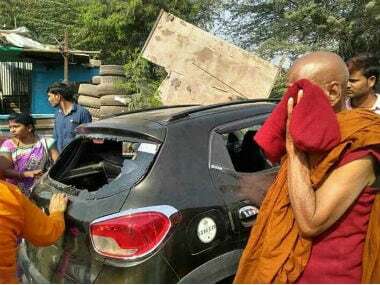 But just that one stone thrown by someone at Sanaswadi snuffed out his life and nobody knows where it came from," he said. Responding to the call given by Bharip Bahujan Mahasangh leader Prakash Ambedkar, a total bandh was observed in Amravati. Protesters submitted a memorandum to the Chief Minister and the Governor through resident deputy collector Nitin Vyavahare. Control of Organised Act. The protesters also demanded permanent police security for the Smriti Stumbh at Bhima Koregaon and compensation worth Rs. one crore to the family of the deceased and Rs.75,000 each to those injured in the violence. They also demanded an impartial probe in the matter through a panel headed by former Chief Justice of India, Justice KG Balakrishnan. The protesters demanded the arrest of Milind Ekbote and Sambhaji Bhide who, they alleged, were responsible for the violence against the Dalits. “We respect the sentiments of Dalits, but we condemn the violence in the state. The government must nab the culprits who started communal trouble.” Sakal Maratha Kranti Morcha told Hindustan Times. "Unlike those in other states, we in Maharashtra have been responsible. We have not done drastic acts. But despite this, the exploitation of our community has continued. The Peshwa Raj has not ended. Ekbote should be charged with murder. We will protest until that's done. We are not resorting to any sort of violence but are co-operating with the police. We want our voice to be heard," says Nitin Dinkar Shelar, 40, a social worker from Pune. 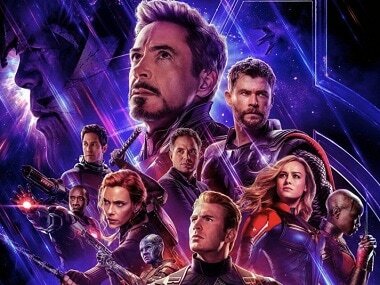 The state-wide bandh called by Dalit groups affected the film and television industry with some shoots being disrupted and others being cancelled as a precautionary measure. A song launch event of Kartik Aryan's upcoming film "Sonu Ke Titu Ki Sweety" scheduled for today at a popular suburban restaurant was cancelled. There was an ad shoot lined up for today but it is not happening now. 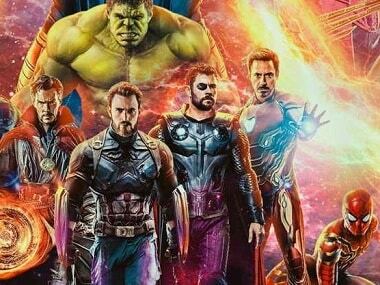 No shoots are currently happening at the studio," a functionary from Mehboob studio said. 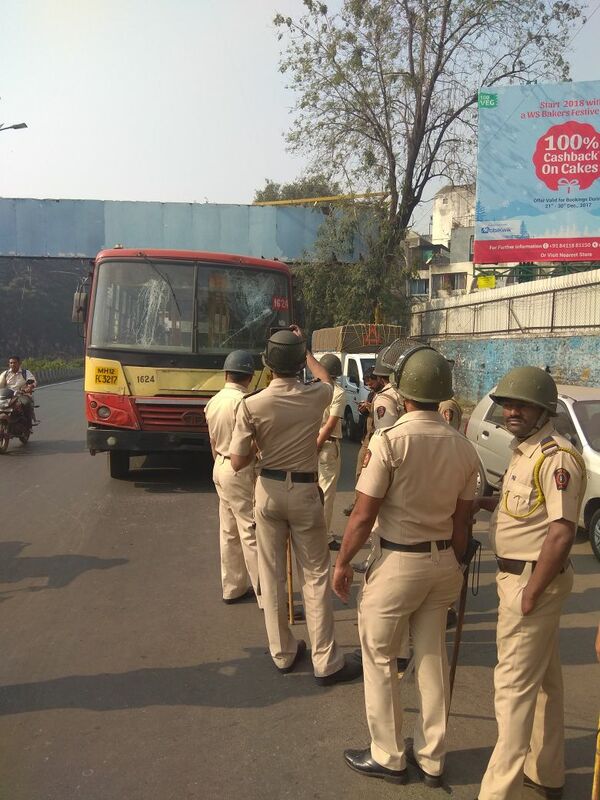 Aurangabad Police have begun combing operation at Ambedkar Nagar, Sanjay Nagar, Shambhu Nagar and Jawahar colony area, said a source from police department. Another source claimed that more than 35 miscreants have been taken into custody as a safety measure. A group of protesters have surrounded the residence of Milind Ekbote, the man charged for orchestrating violence during celebrations of the Battle of Bhima Koregaon on Monday. A large group of protesters were gathered outside his home in Model Colony area in Pune. Traffic on Mumbai roads are slowly being restored to normal. According to latest reports, the Western Express Highway, which was chockablocked, until late afternoon has started clearing up. Traffic on Western Expressway near Dahisar Naka and Aarey Junction is moving now, however, the stretch near Thakur village is still clocked. Worli sea face road is clear, however, some traffic is reported from near Worli Naka. 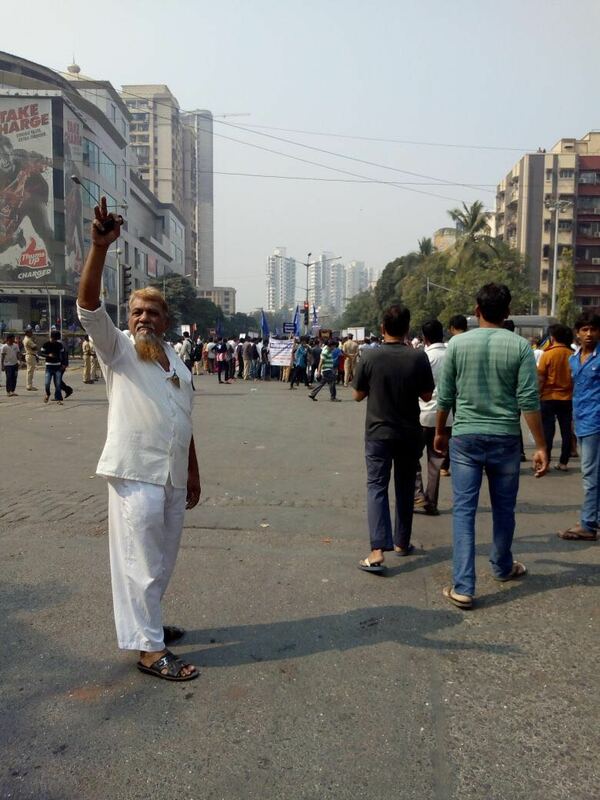 Western Suburbs, including borivali, Kandivali and Goregaon are still partially hit by protests. As pandemonium broke out in the Rajya Sabha soon after the triple talaq bill was introduced, Law Minister Ravi Shankar Prasad said that the Opposition is using the issue of Bhima-Koregaon violence to deliberately prevent the passage of the bill. The Opposition, which was demanding the prime minister's statement on the issue, reacted strongly to the statement and Prasad was shouted down. "We condemn the statement by Law Minister, that we are raising Bhima-Koregaon violence issue to stall the bill. We have been raising the issue of Dalit atrocities as this government is anti-Dalit," senior Congress leader Ghulam Nabi Azad said in Rajya Sabha. Ambedkari Samaj, comprising of several Bahujan organisations, had come together to protest the Bhima-Koregaon attack on Monday. A delegation had gone to meet the Mumbai collector and submit a memorandum on the issue. However, after the Dalit leaders' group realised that the collector is not in office and their memorandum won't be accepted, agitated Ambedkari Samaj members tried to force their way into collector's office building. Kherwadi Police eventually closed the gates and prevented a break-in when women protesters took lead and tried to barge in. This group of protesters is from Kothrud area in Pune. 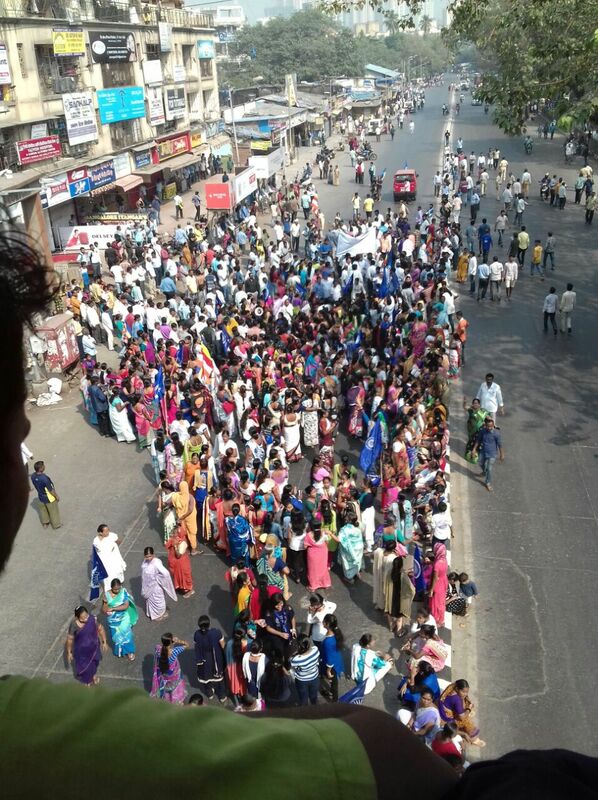 They are marching towards the Ambedkar statue near Pune station. 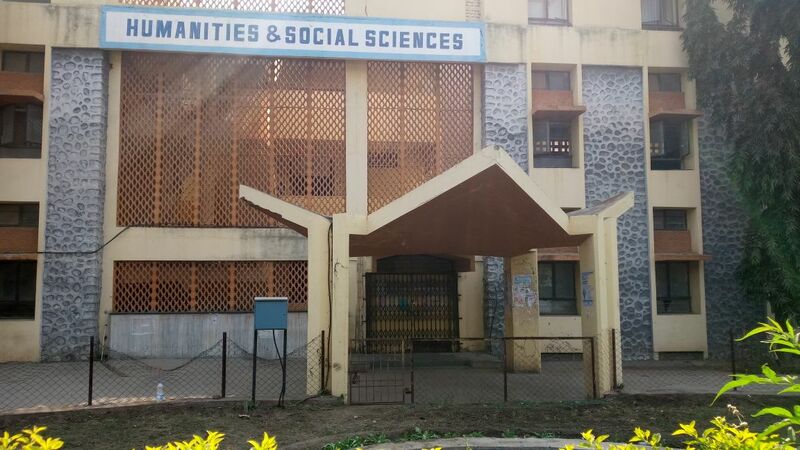 While denying any involvement in the ongoing caste violence in Maharashtra, the right-wing group has blamed the "JNU brigade" for the violence in the state. Several markets and most schools in the city remained closed with protest marches taken out in many sensitive areas. Joint Commissioner of Police Shivaji Bodhke told PTI that two incidents of stone pelting were reported in the city. A man got injured in stone pelting in New Kamptee area, he said. Protesters blocked a road in Hingna area while tyres were set on fire on roads at some places, he said, adding that tight security arrangements have been made across the city. Police making way for Virar train to arrive at Goregaon. The train towards churchgate was allowed to go after being stopped by protesters for 30 minutes. Mumbai-Hyderabad Hussain Sagar Express was held up just before it reached Kurla station. Protesters at Mith Chowky Malad disperse; some stay back, some move towards Marve Road. Vehicles have begun to ply on the road again. Nilesh Mainkar, a peaceful protester in Pune, says that Dalit leader Prakash Ambedkar has his support. 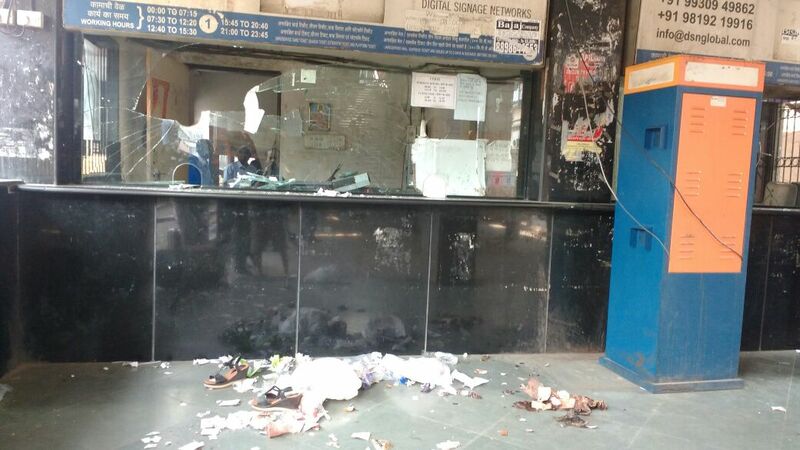 Ticket window vandalized at Dombivali station. All up/down trains stopped till further notice. Miscreants pelted stones at trains between Mankhurd and Govandi stations on the Harbour line. No injuries to anyone. Trains more or less empty. Students belonging to AISA are protesting against the Bhima-Koregaon violence in Maharashtra, reports CNN-News18. The student protesters are demanding judicial probe against those responsible for the violence. 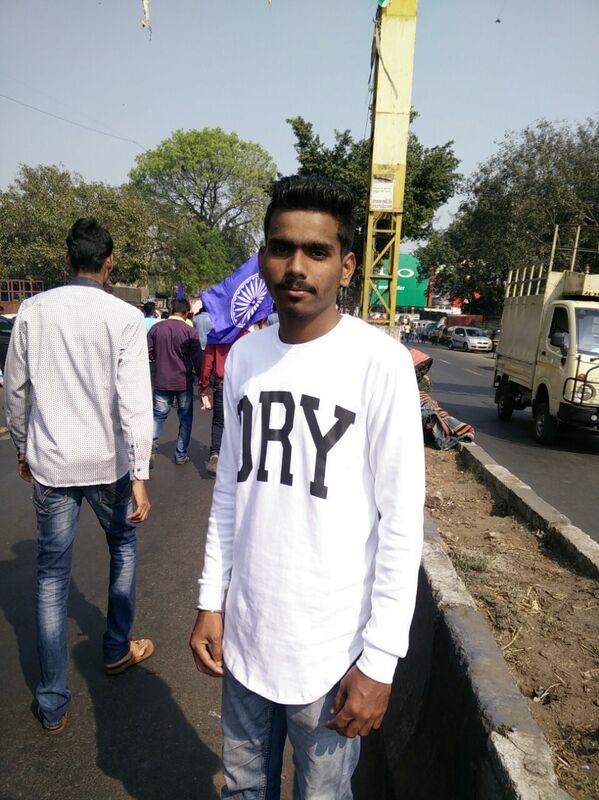 Akash Mane, student leader and Shivajinagar head of Bharat Mukta Morcha, is an arts student at Abasaheb Garware College. He says that Marathas and the Bahujan Samaj are together. "People should know they have the power. This BJP government is a Brahmin government. They are trying to bring communal strife among the Maratha and Bahujan Samaj. We don't want any violence. Media and the police don't pay attention to our issues, so we decided to conduct this rally." While special trains running between Kurla and CST from platform 3. Meanwhile, Harbour line running on time. Avoid using Worli naka. Use Worli sea face road. Traffic on Western Expressway near Dahisar Naka and Aarey Jn is clear now. However, still affected near Thakur village. Traffic on Eastern Freeway is clear now. "Caste-related violence is on the rise in the country. We need to find out who has instigated the further protests. The RSS and other Hindutva organisations are trying to drive a wedge between the Marathas and Dalits in the state. Prime Minister Narendra Modi is silent on the issue, he should come and speak on the floor of the house. He is a 'Mauni Baba' regarding the issue of Dalits. We (Congress) demand an inquiry by a Supreme Court judge," says leader of the Congress party in the Lok Sabha, Mallikarjun Kharge. According to reports, today's prelims exam will be conducted on 14 January. CNN-News18 is reporting that railway services have been halted in Western as well as Central lines in Dadar. Pune Municipal Transport buses brought to a halt at Deccan in Pune. Protesters are not letting the driver move the bus. Protesters garland Sambhaji Maharaj's statue amid calls of Jai Bhim and Sambhaji Maharaj ki Jai. The protest is proceeding peacefully under the watchful eye of the police. The protesters too are cooperating by letting traffic proceed without much trouble. Remaining services of AC local suspended for the day in view of protests.Other suburban services are being run amid intermittent protests at Elphinstone Rd,Goregaon,Dadar, Malad.There is no cancellation of long distance trains, informs Western Railway. "Please don't rely on rumours and only follow official updates, adds Western Railway. Metro services have been stopped in Andheri now. BEST buses also been stopped in Andheri. BEST buses are stranded on all four roads converging in Malad. Parents are taking their kids home walking. Protesters stop a bus and made commuters get out at Ferguson college road in Pune. Cops and other protestors try to control the situation. Some protesters apologise to the bus driver for the trouble caused to him. The rally is progressing towards an Ambedkar statue at Deccan, on Garware Bridge. "We will conduct a peaceful rally, and abide by the bandh peacefully. We are going from Gokhalenagar to put a garland on Sambhaji Maharaja Putala at Garware bridge. Then we will go to BR Ambedkar statue near station and give letter to Collector that all the people behind this incident get arrested," said Sanjay Motling, teacher in Bhartiya Vidya Bhavan. He is the Maharashtra coordinator of Boudha Sangarsh Samiti. Commuters are advised to avoid using Western Express Highway and use S V road instead. Usually one of the busiest areas in Pune, Swargate bus stop wears a deserted look. Metro services at Ghatkopar and airport stations were suspended as a precautionary measure. 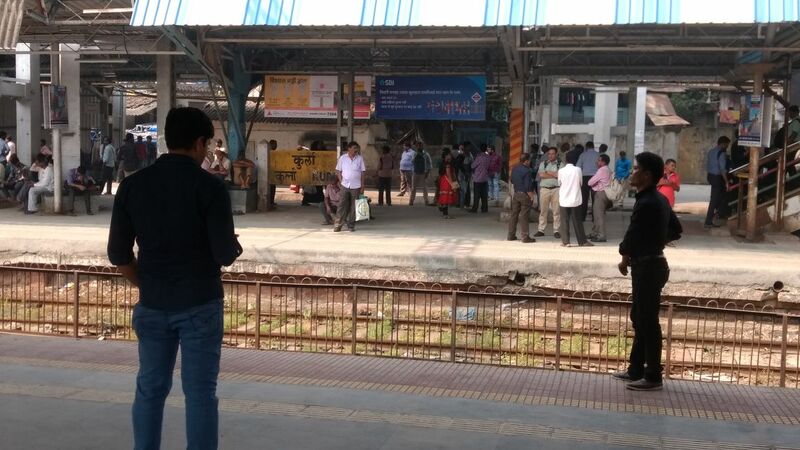 Local train service at Harbour Line was disrupted following protests at Gowadi. Bus services to Satara and Baramati town were suspended this morning, say reports. Commuters in a BEST bus stopped in front of Inorbit mall in Goregaon. Protestors are forcing commuters out. Metro services stopped between Asalfa and Ghatkopar Metro station by protestors, says disaster control room. In view of the state-wide bandh, the Maharashtra State examination council, Pune, has cancelled the computer typing examination which was to be held today. The same will now be held on Sunday. "I appeal to everyone to maintain peace. As for someone like Jignesh Mevani, he has no role in all of this," says Ramdas Athawale. The Eastern Expressway has been blocked by hundreds of activists at Ghatkopar, reports CNN-News18. According to CNN-News18, protesters have forced people travelling from buses in Ghatkopar and Goregaon to get down. According to the report, protesters are stopping buses and allowing only empty buses to go ahead. In addition, the Barkat Ali Road in Wadala too has been closed by the police. Railway tracks have been evacuated and train operations have resumed at Nallasopara/Virar from 10.30 am, says Western Railway. The suburban train services on Central Railway, Mumbai Division's Main line, Harbour and Transharbour line are running uninterrupted except for few minutes agitation at Diwa, Titwala and Vasind but the Railway staff, RPF and GRP officials cleared the path immediately and train services resumed unhindered. Due to this agitation of 10 minutes, a couple of trains were delayed for 5-10 minutes. The shutdown evoked greater response in mofussil areas compared to urban pockets of Thane, Nagpur, Pune and other cities, reported IANS. The coastal Konkan region reported a near-total shutdown, as also Dalit strongholds of Marathwada like Beed, Latur, Solapur, Jalgaon, Dhule, Ahmednagar, Nashik and Palghar. Kandivali- Akurli, Dindoshi-Hanuman Nagar, Chandivali-Sangharsh Nagar, Khairani Rd- Sakinaka, Sahar Cargo, Mulund Check Naka, Jijamata Nagar. Fortunately, there has been no stone pelting incidents in Mumbai so far. ANI is reporting that Jan Adhikar Party (JAP) leader and Madhepura MP Pappu Yadav gives adjournment motion notice in Lok Sabha over the caste violence in Maharashtra. CPI leader D Raja gives zero hour notice in Rajya Sabha over "increasing atrocities against Dalits", reports ANI. Some autos and taxis were seen plying in various areas, but the famed Dabbawalas cancelled their services for the day. Many shops and establishments also opened for work as usual in the city and suburbs and there were the familiar crowds on roads and highways, reported IANS. While the fish market in Dadar is shut for the day, the flower market, however, is bustling as usual. A mob pelted stones towards a private bus which was on educational tour in Aurangabad district. Around 40 students from Gagangiri Vidyalaya, Pandharpur tehsil, Solapur district were on board. A teacher and a student are injured in the incident. The incident occurred around 7 am today near Deogiri school, Daultabad fort, 13 km from Aurangabad. Trains are running late by at least 30 minutes from Borivali, an important junction on the Western Railway. Protesters tried to disrupt rail services in Virar at about 8.30 am. however, after a 10 minute disturbance, the police was able to re-start the train services from Virar. Home Minister Rajnath Singh will be making a statement on the ongoing caste violence in Maharashtra in the Lok Sabha on Wednesday, reports CNN-News18. "Do not believe in or spread rumours and continue with the daily activities. The Police administration is there and geared up to deal with any untoward situations," says Mumbai Police. Dabbawala association spokesperson Subhash Talekar told mediapersons that they won't be delivering tiffins to people fearing the law and order issues in the city. "Please don't believe in rumours. Central Railway will keep you posted with hourly updates," Sunil Udasi, CPRO of the Central Railways tells citizens. Few protestors tried to disrupt Railway services at Thane but were immediately cleared by RPF and GRP officials. Services are running uninterrupted on Central Railway as of now, said Central Railway. "How can we take the risk? In the morning too, six buses were stoned in Chembur area of Mumbai. We will take a call at 11 am for the second shift. We have to think about the safety of children and cabs and autos too are not working as usual in Mumbai," Anil Garg told CNN-News18. According to CNN-News18, battalions of Rapid Action Force have been deployed in Mumbai, especially in eastern suburbs like Chembur, which was affected by violence on Tuesday. A blame game has started in Maharashtra over who triggered the caste clashes, reported Economic Times. 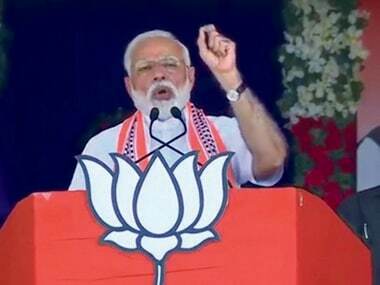 On the other hand, Prakash Ambedkar of the Bharipa Bahujan Mahasangh (BMM) accused right-wing groups, especially the Hindu Ekta Aghadi and Shivraj Pratishthan, headed by Milind Ekbote and Sambhaji Bhide, respectively. In 1818, the Peshwa attempted to retake the city of Pune from the British with a force of 28,000 men — 20,000 cavalrymen and 8,000 foot soldiers — mostly comprising of Marathas. A British force, comprising no more than around 800 soldiers, was on its way to Pune to meet with the main force stationed there when the Peshwa’s advance force spotted them. As the British took refuge in a small village called Koregaon, which was surrounded by a low mud wall, the Peshwa decided to detach a small portion of his army, around 2,000 soldiers, to take on the British forces and the village of Koregaon. On 1 January, 1818, East India Company troops, comprising mostly Mahar Dalits, fended off the Maratha offensive. The soldiers fought through the night and managed to defend the village of Koregaon from the attackers. According to one estimate, the Company lost between 200-300 troops that night but the Peshwa suffered heavier losses as 500-600 of his men perished in the battle. The Marathas, wary of reinforcements arriving from Pune in much larger numbers than their own, were forced to retreat. Mumbai Traffic Police is taking precautionary measures to ensure smooth flow of traffic. "All traffic personnel will be on their toes to ensure smooth flow of traffic, especially on the Eastern Express Highway," police officer told DNA. The disturbances erupted in the village of Koregaon-Bhima on 1 January during the 200th anniversary celebrations of the Anglo-Maratha War between the army of Peshwa Bajirao II with a small force of the East India Company that comprised a large number of Dalits. In the clashes that ensued between the two groups, more than 30 vehicles, including buses, police vans and private vehicles, were torched or damaged and one youth, Rahul Fatangale, 28 of Nanded lost his life. Maharashtra chief minister Devendra Fadnavis on Tuesday said a judicial inquiry has been ordered into the violence which erupted during the 200th anniversary celebrations of the Bhima-Koregaon battle in Pune district." A sitting high court judge will head the inquiry," Fadnavis said, adding that Rs 10 lakh compensation would be given to kin of the youth killed. The youth's death would be probed by the CID, Fadnavis told reporters. The Rashtriya Swayamsevak Sangh (RSS) on Tuesday condemned the incidents of violence at Bhima-Koregaon village in Pune district and other parts of Maharashtra. Manmohan Vaidya, the akhil bhartiya prachar pramukh of the RSS, in a press statement uploaded on the outfit's Twitter handle, stated, "The recent incidents at Koregaon, Pune and various other places in Maharashtra are very sad and painful. RSS strongly condemns such violence and feels it is despicable. "Those who are found guilty should be punished as per law. Some forces are trying to create hatred and animosity among communities. The people should not fall prey to such nefarious tactics," PTI quoted the press release as saying. 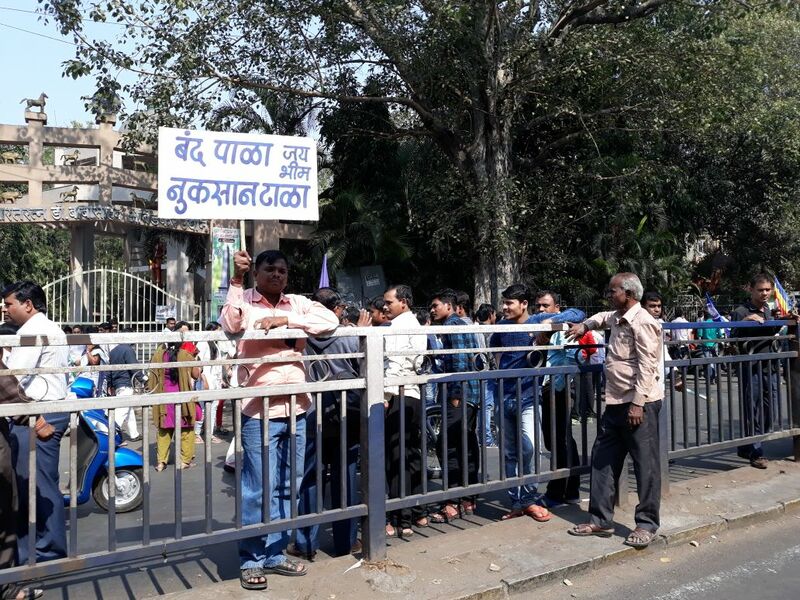 Protests and violent incidents were witnessed in other parts of the state, including Ahmednagar, Jalgaon, Dhule, Beed, Nashik, Pune, Solapur, Thane and Palghar as Dalits expressed their ire over Monday's incidents in Koregaon-Bhima in Pune district. At least 25 buses of the Maharashtra State Road Transport Corporation, besides private luxury buses and other vehicles, were damaged in stone pelting by riotous mobs, reported IANS. The police today said they had received a complaint against Gujarat MLA and Dalit activist Jignesh Mevani and Delhi's Jawaharlal Nehru University's (JNU) student leader Umar Khalid for their "provocative" speeches at an event here on 31 December. Mevani and Khalid had attended the "Elgar Parishad", an event organised to commemorate the 200th anniversary of the battle of Bhima-Koregaon, at Shaniwar Wada in the city on 31 December. According to the complainants, Akshay Bikkad and Anand Dhond, Mevani and Khalid had made "provocative" comments at the event, PTI reported. “We have made elaborate arrangements to keep the situation under control in view of the bandh. Extra forces have been kept on standby. Some areas have been identified where internet could be suspended so people cannot spread rumours on social media,” DGP Satish Mathur told The Indian Express. While the Prakash Ambedkar faction as well as 250 Dalit outfits have called for a Maharashtra bandh today, the RPI(A), a constituent of the NDA, will not be participating in it. "We will not participate in the Maharashtra bandh, but rasta roko and morchas to various police station in Mumbai will continue on Wednesday," Gautam Sonawane, RPI (A) state president told The Times of India. Several towns and cities in Maharashtra were on edge on Tuesday as Dalit protests against Monday's violence in Pune spilled over to capital Mumbai, with agitators damaging scores of buses, and disrupting road and rail traffic, officials said. Clashes between Dalit groups and supporters of right-wing Hindu organisations during the 200th anniversary celebrations of the Bhima-Koregaon battle in Pune district had left a man dead on Monday. In Pune, cases were registered by the Pimpri police against Milind Ekbote and Sambhaji Bhide, who head the Hindu Ekta Aghadi and Shivraj Pratishthan respectively, for allegedly inciting the violence. The two organisations had opposed the celebration of "British victory" in the battle. Over 160 buses were damaged in Mumbai by rampaging protesters over 100 of whom were detained, police said. DCP Nitin Pawar has assued that there is no congestion on the routes in Navi Mumbai. He said: "Traffic situation is absolutely Normal in Navi Mumbai. Only heavy vehicles like trucks, containers- trailers are stopped on road-side at convenient places so that they should not cause any inconvenience on Eastern Express Highway (EEH)/Chembur area and no more congestion should be allowed on EEH. This stoppage of heavy vehicles is not affecting flow of traffic in Navi Mumbai." Eldine Fernandes, a national award-winning sculptor, lost over Rs 50 lakh worth of paintings, sculptures, equipment in the violence on Monday. He had been working in this studio which was burnt to the ground by the ravaging mob. A Christian himself, he had statues of BR Ambedkar, Shivaji, different animals, angels, all stored in his studio by the side of the road in Bhima Koregaon. The bandh called by Dalit groups tomorrow has been supported by Bharipa Bahujan Mahasangh chief Prakash Ambedkar and CPM. However, no main political parties from Maharashtra, mainly Congress, NCP, Shiv Sena, MNS have extended their support till now. Jet Airways, Air India waive off cancellation charges from Mumbai due to ongoing volatile situation in the state. In a press release, CPM has said that the bandh will condemn the "entire manner in which the BJP-led state government headed by Devendra Fadnavis handled the situation." The Left party has alleged that "no action was taken" ahead of New Year, even though the state government was "well aware that lakhs would gather to commemorate the 200th anniversary of this battle." CPM criticised the fact that no arrests have been made for the death of Rahul Fatangale, the Dalit youth who was killed on Monday during the violence. "It appears that this violence has been deliberately engineered by right wing forces to incite casteist and communal polarisation in the state," the party said. However, CPM has appealed for a "peaceful and democratic" protest. Fewer Ola, Uber taxis are seen on the roads in Mumbai. The drivers are reportedly preferring to stay out of roads as a precautionary measure. Speaking to Times Now, Sanjay Raut said: "The incident has not happened suddenly. There is a political conspiracy behind this. Some force wants to break Maharashtra. The government needs to ponder why these incidents have increased. Since the time this govt has come into existence,,these things have been happening." 1. Vikroli north and south bound diverted to LBS road. People have been advised to instead go through LBS Road, where traffic is moving though slow. A Maharashtra State Road Transport Corporation (MSRTC) official at Breman Chowk bus stop in Pune has confirmed that ​all MSRTC buses from Pune to Mumbai have been cancelled for the day. "Those who had reserved tickets will be refunded soon," he has said. Buses to Dadar, Nashik, Aurangabad, Kohlapur from Pune have stood cancelled since around 1 pm. Apart from the medical shops, every other shop has been made to shut in Amrut Nagar area of Ghatkopar West. SM Shetty school in Hiranandani, Powai, has informed the parents to pick up their kids from the school. NCP leader Majeed Memon hit out at Maharashtra government over the violence in parts of Mumbai and Pune. Speaking to CNN-News18, He said: "The present govt is literally no government, There is no coordination between Shiv Sena and BJP. Judicial enquiry (ordered by Chief Minister Devendra Fadnavis) is only for self-satisfaction. You have to come down on the streets and see that the violence is stopped forthwith." Would Dalit leader's call for bandh make an impact? Following the incident at Bhima Koregaon in Pune, national leader of Bharipa Bahujan Mahasangh Prakash Ambedkar has called for a Maharashtra shutdown on Thursday. However, it is to be seen if the call would have any real impact on the ground as the political entity doesn't command enough hold in state politics. State government buses aren't plying on schedule from Pune to Mumbai. Speculation is that disturbances on the expressway near Mumbai is the reason. Pune-Mumbai Shivneri buses are running behind schedule by over an hour currently. ​Maharashtra chief minister Devendra Fadnavis has told reporters that he will order a CID probe. Meanwhile, Union minister Ramdas Athawale has told Times Now that he has appealed to Dalits and his supporters to maintain calm. The event to mark 200th anniversary of the Bhima Koregaon battle in Pune district, in which forces of the East India Company defeated Peshwa's army, was marred by incidents of violence, with at least one person getting killed. Maharashtra chief minister Devendra Fadnavis made an appeal for calm in the state and said that it was the police that bought the situation under control. "Some vehicles were burnt but police controlled the situation. All the people present at the event were escorted by the police and safely taken to their respective homes. One person was killed and we have launched a probe. If policemen weren't there in sufficient numbers, the situation could be much worse," he said. A day after Dalit and Maratha groups clashed in Pune on the 200th anniversary celebrations of the historic Koregaon Bhima battle, Dalit protesters staged a protest in parts of suburban Mumbai, a report in Mumbai Mirror said. The Indian Express reported that Dalit groups, seeking action against those involved in Monday's clashes which killed one and injured several others, called a rasta roko aandolan which affected many parts of Mumbai including Mulund, Chembur, Bhandup, Vikhroli and Kurla. India Today reported that incidents of stone pelting occurred in Ghatkopar. According to a report in DNA, tension gripped the Mumbai suburb of Chembur and an eyewitness told the newspaper that when he visited a bank at noon, a group of boys approached the bank and demanded shutters be downed. "The shutters were downed at Chembur station as well," he added. Eyewitnesses told the newspaper the commotion began at Chembur naka. The police quickly reached the spot and brought the situation under control, DNA reported. "There are groups of 100 people at Mulund, Chembur, Bhandup, Ramabai Ambedkar Nagar in Vikhroli and Nehru Nagar in Kurla attempting a rasta roko. We have managed to avoid it so far," additional commissioner of police (East Region) Lakhmi Gautam told The Indian Express. Chief Minister Devendra Fadnavis has ordered a judicial inquiry into the clashes that took place on Monday, India Today reported. Monday's violence reportedly occurred after a group carrying saffron flags began pelting stones days after the tombstone of local Dalit hero Govind Gaikwad was vandalised, leading to clashes with groups bearing blue flags. Section 144 (unlawful assembly) of the Criminal Procedure Code was implemented across Pune district by the collector, Mumbai Mirror reported. What is the Battle of Koregaon? Monday marked the 200th anniversary of the Battle of Koregaon, where the Marathas led by Peshwa Bajirao II clashed with the British East India company. The battle, which took place in Koregaon, a small village 25 kilometres from Pune, pitted 800 British soldiers against 30,000 Marathas on 1 January, 1818. However, fearing that the British may send reinforcements in the form of a larger battalion, the Marathas withdrew after a 12-hour standoff. 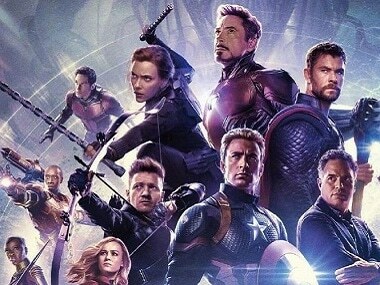 In all, about 1,000 people died in the battle.